We reached San Pellegrino after a very steep climb to almost 1525 meters 5000 Ft . The church and shrine sits on a small mound with steep drops at each side. It must have one of the most spectacular views in Tuscany although it straddles Tuscany and the Emilia-Romagna (see photo of the divide). Popular imagination has created a legendary life for San Pellegrino, which was spread by the lay brothers of the communities that attempted to collect alms for the poor. 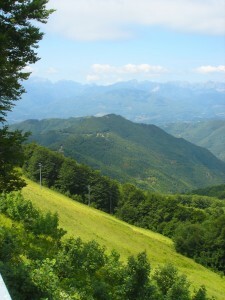 According to the legend, San Pellegrino is the son of King Romano of Scotland and his wife Plantula. (I cannot find anything about this king!) He performs miracles from the day on which he was baptised and after a childhood of penance, he renounces the succession to the throne and sets off for the Holy Land, accompanied by a band of thieves who he has miraculously converted! After suffering persecution by the Saracen’s he ran away and legend has it that he reached the Appenine mountains sailing upon his cloak and guided by a star, nice! 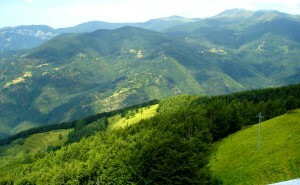 So green and so high! 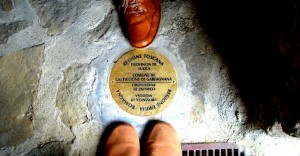 At San Pellegrino he lives in a cave where he is visited by wild animals, whom he then befriends. Many years later he removes to a suitable location for penance, sheltering inside a hollow tree. 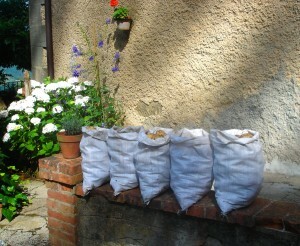 S. Pellegrino dies at 97 years old, after having written his life on the bark of the tree. A man and wife from Modena, guided in a dream by an angel found his body intact, guarded by a great number of animals. The bishops and populations of Tuscany and the Emilia flocked to the place and a dispute breaks out between the Emilian’s, who want to transport the Saint to the plains and the Tuscans’ who claim him; having died within their borders. To resolve the issue they then put the corpse in a coffin on a cart and it is then pulled along by two wild bullocks, one Tuscan and the other Emilian, and they stop at a place called Termen Salon which became St Pellegrino in Alpi. 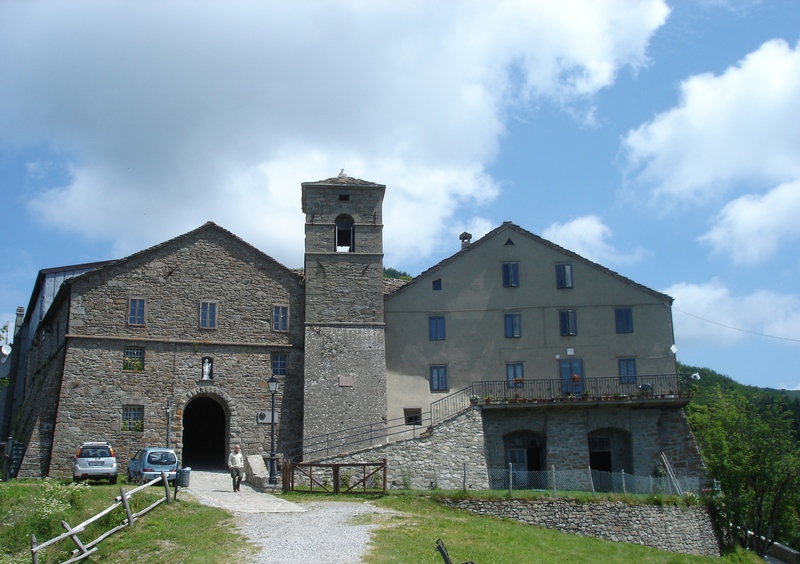 A basilica is created here in honour of San Pellegrino, whose Dedication is given 10th August 643 A.D. At this location, where many miracles occur, the site becomes honoured by popes and emperors, is then created a house of refuge to receive those who flock to venerate the Saint. Pilgrims visit the site to this day. It is worth remembering that the cult of San Pellegrino, despite having had a great popular following in the past still receives pilgrims to the present day. However he has never been officially recognised by the Catholic Church. San Pellegrino is laid out with his former pagan friend San Bianco; whom he converted. 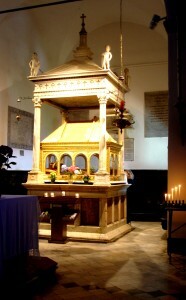 The Saints’ look very comfortable together in their reliquary which is a large gold and glass case. I was not sure about seeing them so close up. However when I went forward, San Pelligrino’s remains show a smile on his face, which you could be forgiven for not expecting on a corpse! The most noticeable things were their shoes, with no wear on the bottom as they have never walked in them….. in this life! San Bianco maybe the same saint as Bianco da Siena who wrote the Discendi amor santo, the words for the hymn Come down, O love Divine, known by most to the music of Ralph Vaughan- William’s ‘Down Amphy’, see link below. However this seems unlikely as the dates for San Pellegrino and San Bianco da Siena are too far apart to fit. San Pellegrino in Alpi has three places to eat, a church with a shop for pilgrims to purchase icons etc, a museum of local life and gift shops. The area is a fantastic place for walks in some of the most spectacular mountains in the Alpi. Take an extra layer, as we went in July and I needed a jumper: which I did not have with me!! Over the stream, a narrow rift of sky. 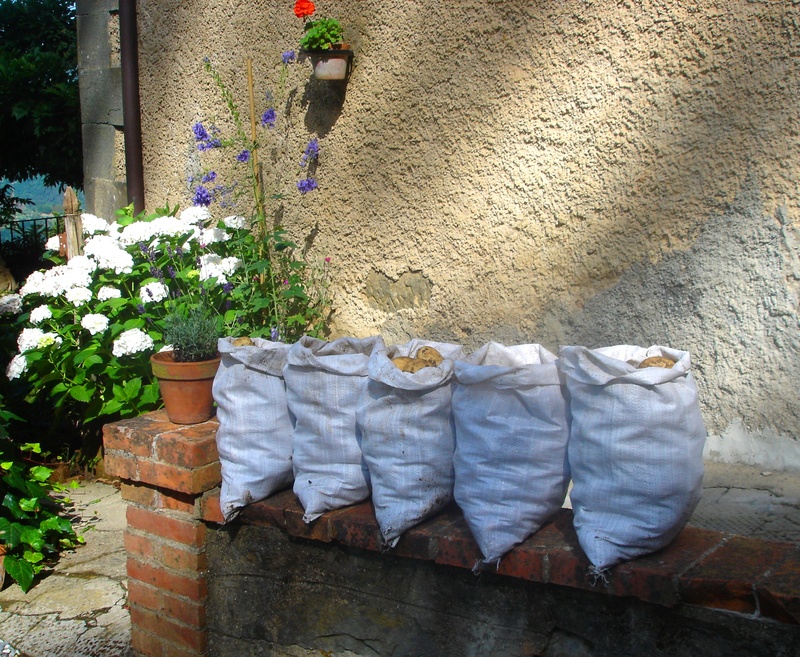 And in local news the potatoes are ready – five sacks of potatoes sitting on a wall!! No singing please!